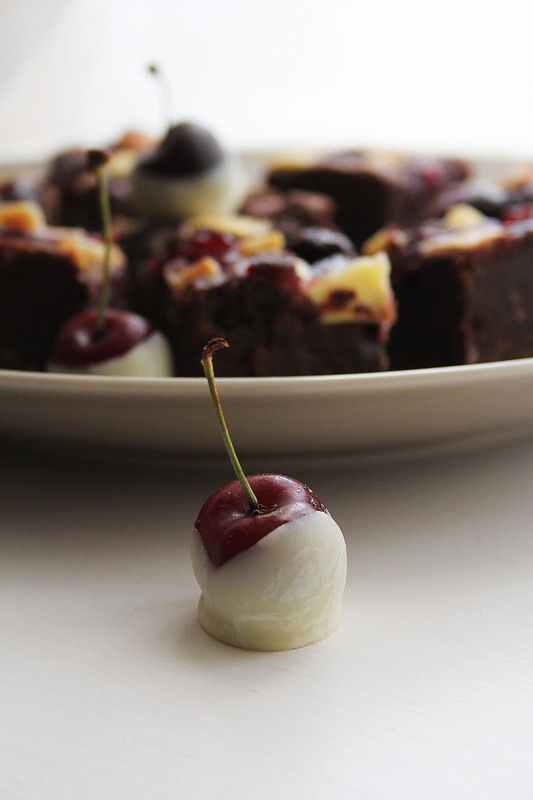 These fudgy brownies incite frenzied eating in my house; they barely saw the light of day when I made them last and half my family were out… It’s hardly surprising they are so addictive though- white chocolate matches brilliantly with fresh cherry compote (particularly when accompanied by a very generous glug of slightly unseasonal brandy). Start by making the compote. Roughly chop the cherries. Place in a pan along with the sugar, water and brandy. Heat gently, stirring occasionally, until the cherries become soft and the syrupy liquid starts to thicken (about 10 minutes). Once the consistency is somewhat jam-like, taste and add more brandy if you like (you can leave out the brandy entirely if it’s not your jam- ha.). Set aside to cool. Preheat the oven to 170c. Grease and line a brownie tin (around 22x22cm is perfect). Place the butter and dark chocolate in a heatproof bowl and set over a pan of gently simmering water (don’t let the water touch the base of the bowl). Stir occasionally and remove from the heat once melted together. Place the eggs and caster sugar in a large bowl (or bowl of a stand mixer) and beat together until well combined. Add the chocolate mixture to the bowl and fold in followed by the flour and 2/3 of the white chocolate chunks. Tip into the lined baking tin and level out. 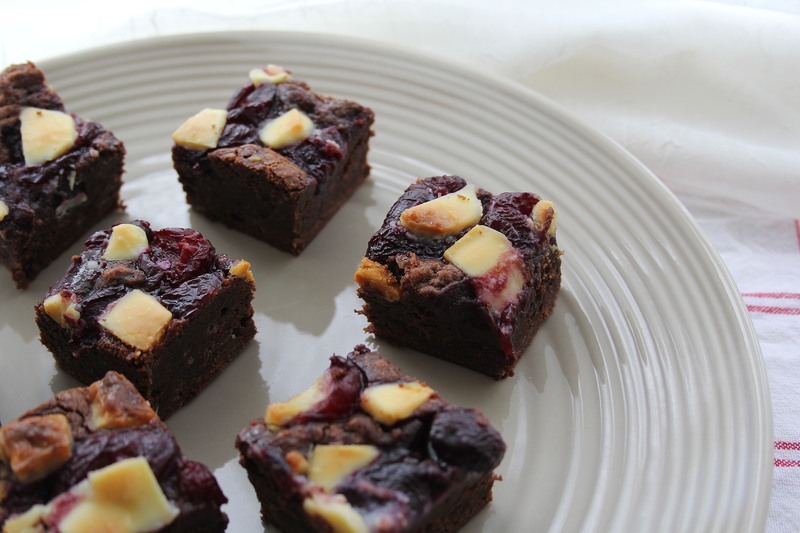 Dollop the compote all over the surface of the brownie and finish by sprinkling on the remaining white chocolate. Bake for 25-35 minutes until the top is set but the inside is moist and a little gooey. 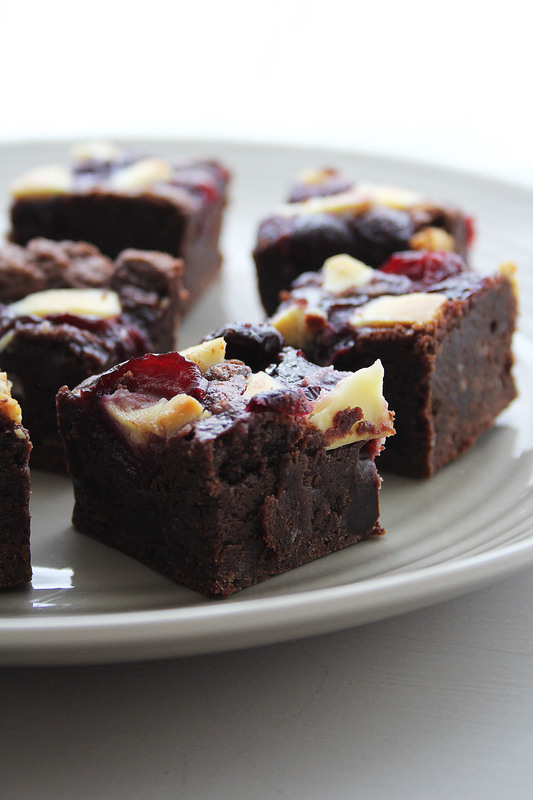 Allow the brownie to cool completely in the tin then slice up and serve.